All 46 FIRs registered over the farmer unrest in Mandsaur district pertain to acts of arson and violence by protesters demanding better prices for their crops and loan waiver; no case is lodged against police. 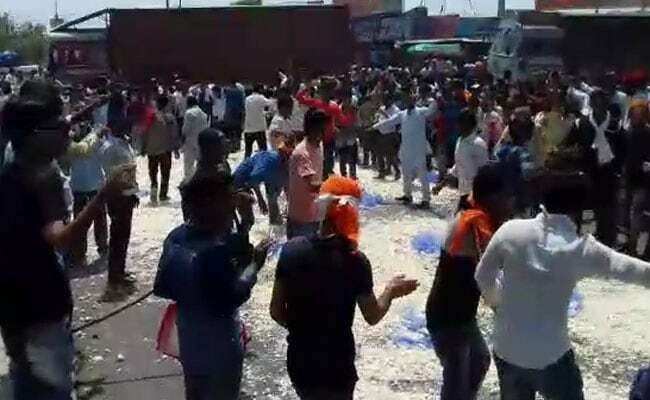 Nearly a week after five farmers were allegedly killed in police firing in Madhya Pradesh's Mandsaur district during a protest, a top officer of state police has confirmed to NDTV that no FIR or First Information Report has been filed against the policemen responsible. The police has registered 46 FIRs over the farmer unrest in Mandsaur district. All of them pertain to acts of arson and violence by protesters demanding better prices for their crops and loan waiver; not a single case has been lodged against the police. The government has instead constituted judicial inquiry, headed by a retired judge AK Jain. State Home Secretary Madhu Khare was transferred today and two officials had been suspended earlier. Madhya Pradesh farmers protest: Police opened fired at protesters in Mandsaur on June 6. Sanjay Hegde, a Supreme Court lawyer, told NDTV that a judicial commission alone is not sufficient to probe the police firing. As per the law, he said, an FIR should be registered in the killing of the five farmers, and an investigation launched. The police official argued that they had to fire in self-defence, and there is no case against the men in khaki. Madhusudan Patidar, the brother of Abhishek Patidar, a class 12 student who was shot and killed by the police said the threat posed by the protesters was not so great that the police had to shoot to kill. Madhusudan, who was also present at the spot, told NDTV, "The police opened fire directly, without any warning. We were standing there. If they had warned us we would have run away. Why would we wait to get shot?" The Madhya Pradesh government had admitted last week that five farmers were killed during a protest on June 6 in Madhya Pradesh's Mandsaur due to police firing, after strongly denying it earlier. A sixth one died the next day from injuries allegedly due to police action. Those responsible would be punished, state Home Minister Bhupendra Singh said.